I have to say that I’m really liking the iPad Pro. Apart from times when I have to code and when I need Lightroom (Lightroom on the iPad is useless for the work I want to do), it is the machine I take with me in my backpack. 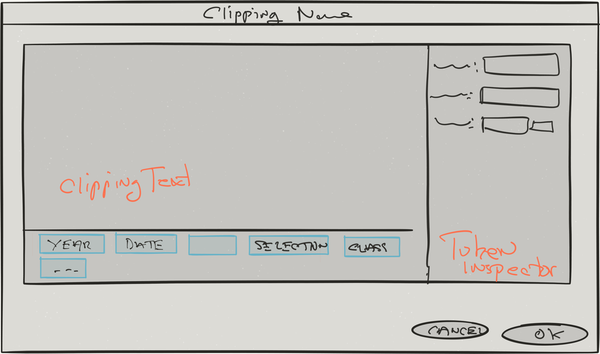 I like to make rough sketches of software UI ideas as I work. I’ve tried several styli over the years and never been totally happy. I have been using a 53 Pencil which I liked quite a lot, but then I got an Apple Pencil. Its clearly nicer and the closest yet to drawing in my paper journal. I’m no artist at all, but these tools let me quickly capture what I’m imagining as I work. As I get older, I find that getting ideas out of my head and capturing them in some form becomes more and more critical to my work process. Drawing with the Apple Pencil is faster and more responsive, and while its not in evidence in this example, pressure sensitivity helps. However, I do miss the eraser on the 53 Pencil a lot. I used to make these sketches in my paper journal (which I still carry with me) but being able to make a quick sketch like this and attach it to an item in my bug database is better.